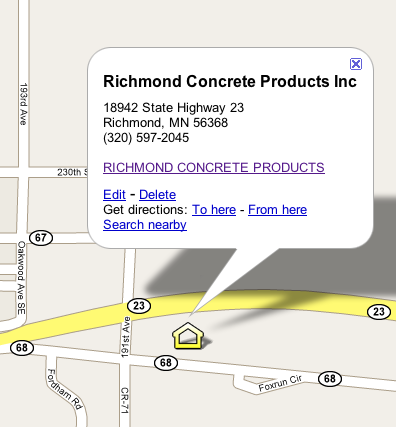 DigElink ROCORI: Richmond Concrete Products Inc.
Richmond Concrete Products your local source for everything from concrete blocks decorative retaining walls since 1905. Today’s concrete products are more than just the foundation to your home. Richmond Concrete Products manufactures and sells all types of blocks for foundations, paving, edging, sidewalks and retaining block in a wide range of size and color. For that distinct look, quality, strength, and durability think Richmond Concrete Products. Whether you're looking for a decorative wall or a more utility function retaining wall, the HillCrest retaining wall system has the versatility and structural strength to meet your design needs. Richmond Concrete paving blocks that can create your new driveway and lighter blocks better suited for walkways and sidewalks. Another unique Richmond Concrete product is the "Jumbo Bullet Edger", a favorite for landscaping both the front lawn and along the backyard garden. Homeowners, contractors, small projects or large commercial construction, Richmond Concrete Products has the team experience, knowledge and capability to get the job done right. You can rely on the Vogt families three generations of business know how to help you choose the right product for the right construction application.